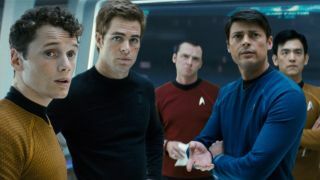 Quentin Tarantino, known for directing films like Pulp Fiction, Inglourious Basterds and Hateful Eight (which is to say hyper-violent movies where the characters drop f-bombs) might direct the next Star Trek movie. Which... uh, seems like an odd fit, if I'm being honest. Deadline reports that according to unnamed sources - that's your cue to sprinkle some grains of salt on your reaction to this news - Tarantino has shared a "great idea" for the sci-fi franchise with JJ Abrams, and will assemble a writers room. These wordsmiths will listen to Tarantino's secret idea and work together to pen a screenplay. If Paramount likes the results, Tarantino would direct the movie, with Abrams serving as producer. Before you start getting too anxious / excited, there are a few reasons to temper your expectations: One, people in Hollywood are constantly talking about how much they'd like to do certain films. I bet if you asked him, Adam Scott would love to have a major role in Star Wars 9 - doesn't mean it's gonna happen. (Also, that's nothing against Scott, I just know he's big into the franchise). Second, we know nothing about Tarantino's idea, so I'd say Paramount giving the green light is a big "if" at this point. Third, Tarantino has typically created original works. He directed two episodes of CSI and one episode of ER, but has never made a movie from someone else's intellectual property. This might just be me speaking, but I think this is a horrible fit for Tarantino. Bless him if his idea really is that good, but Star Trek is distinctly rooted in optimism for humanity, and Tarantino's movies are typically... uh, not. Even setting that aside, Tarantino is known to be a very controlling auteur who has specific quirks to his filmmaking process, and I can't imagine him wanting to be constrained by Paramount. But what do you think? Does the idea of a Tarantino Star Trek make you excited or dismayed?